Oh my! 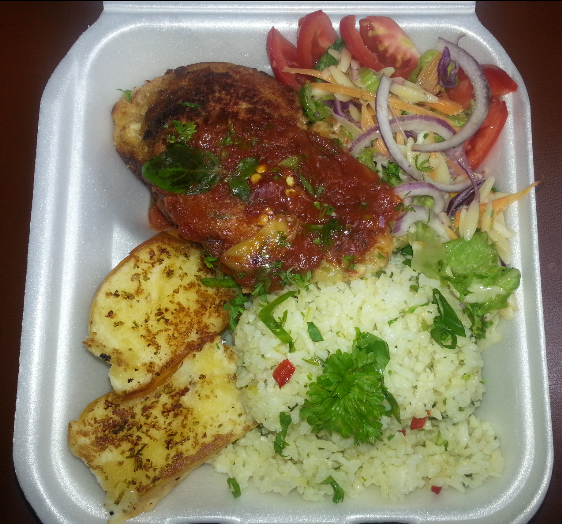 Check out this lunch from Layer Cake! The Layer Cake went World Cup crazy with an Italian menu last Friday. It’s a pity the Italian fans could not celebrate a victory and the deliciousness!!! Tender and succulent breast of chicken stuffed with roasted garlic, fresh basil, olive oil roasted tomatoes and a classic 3 cheese combination of fresh mozzarella, aged parmesan and mild cheddar. Drizzled with a spicy marinara sauce. Served with an orzo garden salad and a herb rice pilaf. This tasted just like how it sounded, ABSOLUTELY Spectacular. Cost: $1200JMD and they deliver! After popular demands I cannot wait to see what is in store for this week and next week, will it be French or Brazilian?! The Italian Restaurant, Luna di Mare is the winner for fine dining restaurants at the Hilton Rose Hall Resort and Spa. Two Saturdays ago, it was an elegant evening for my party of four. It was also a refreshing experience compared to the mediocre service, quality and poor range of options offered by the Main Buffet Restaurant and Grills during the days. Our waiter, Kenrick pleasantly greeted the table and within 5 minutes our appetizers arrived, of which we all chose the Seafood Soup of the day. It was a bit spicy, but to the right degree. I must also point out that the table’s serving of garlic bread came with a very tasty Pesto sauce. Their menu included Pizzas, Pastas and Piattis with salivating descriptions of a Salmon Filet Risotto, Seafood Medley Pasta with creamy tomato sauce, Smoked Salmon Spaghetti with pesto cream sauce and more. Kenrick was quite knowledgeable about the menu and based on his description of various items on the menu I ordered the Fusilli Marinero, the Seafood Medley consisting of fish, scallops and shrimp with creamy tomato sauce. I suppose either my friends were not feeling as adventurous that night or the dish just seemed so appealing that we all ordered the same thing. The pasta was as good as we thought it would be. Our servings were filling and the quality so satisfactory to our standards, that there was no room or need for dessert, so we enjoyed the quiet, dimly lighted setting with Italian themed wall paintings as we chatted about current affairs and sipped Chardonnay. 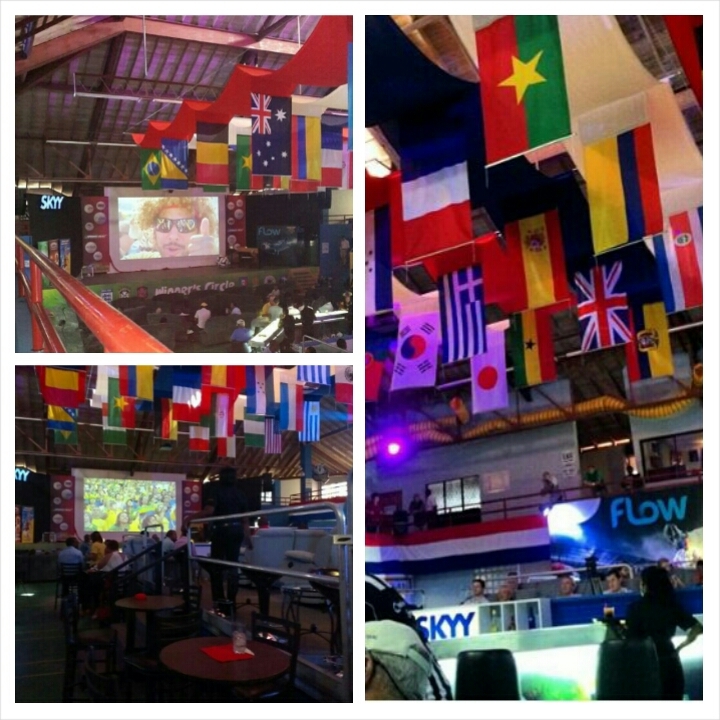 Sports Zone at the CBA is ready for the World Cup, where is not?! The Sports Zone at the CBA has free entry, food by Jacqui Tyson on sale and drinks on sale. I’ve heard it also has its own feed and not the poor quality feed from CVM. VIP seating and parking available. No wonder you have to get there early before the crowd. Word has it that a company has bought out the main viewing area of Triple Century for World Cup so it’s continuously filled with their employees. Not a good look. Tracks and Records and Cuddyz are definite NOs to view the World Cup or to even go and eat or drink for that matter. Extremely poor service and food quality. The screens can hardly even be viewed properly at Tracks. What a shame. This week we say GOODBYE to SPAIN, CAMAROON, AUSTRALIA, ENGLAND, HONDURAS and BOSNIA ! CONGRATS to NETHERLANDS, CHILE, COLUMBIA, COSTA RICA, FRANCE and ARGENTINA, all quickly moving on to the Knock out rounds. It was the night to see what fine dining restaurants at the Hilton had to offer last week Thursday for the Rotaract District 7020 Conference. Of over 100 attendees, 32 dined at the Seaside Grill including myself. Our reservation was made weeks in advance and everyone was on time for their 8:00pm reservation excluding about 4 of us. So I was surprised to see them off to such a slow start. By 8:20pm only some orders were taken and no appetizers had arrived as yet. I quickly contacted our Sales and Catering Manager who came down to the restaurant soon after. Then things started clicking. I ordered at 8:30pm, immediately got my Lobster Bisque that was quite appetizing. We waited a little bit for our entrees that arrived at 9:05pm, but the wait was tolerable and quite worth it. I had the Seafood Mixed Grill with shrimp, fish and scallops kebab style accompanied by Cilantro Beurre Blanc, Rice and Vegetables. 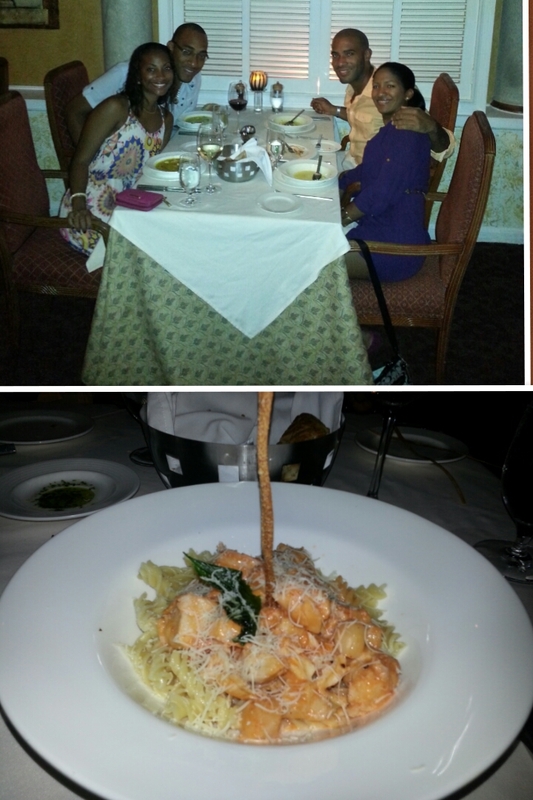 It was surely divine as the Cilantro Beurre Blanc sauce truly complemented the seafood well, as expected. Others were happy with their entrees, all of good serving sizes. 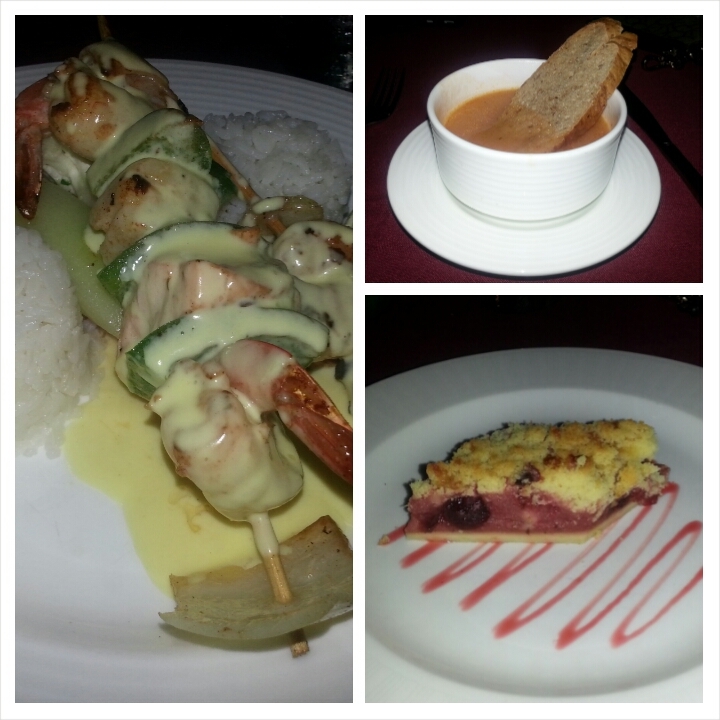 Persons had Pork Loin, Grilled Swordfish Steak, West Indian Spiced Curry Shrimp, Beef Tenderloin and more. Clearly a wide range on the menu. Sadly the Pie and Chocolate Cake may have given us diabetes, but the lucky ones had tasty Ice Cream and the divine entrees were still on our minds. A decent selection of wines were also available. 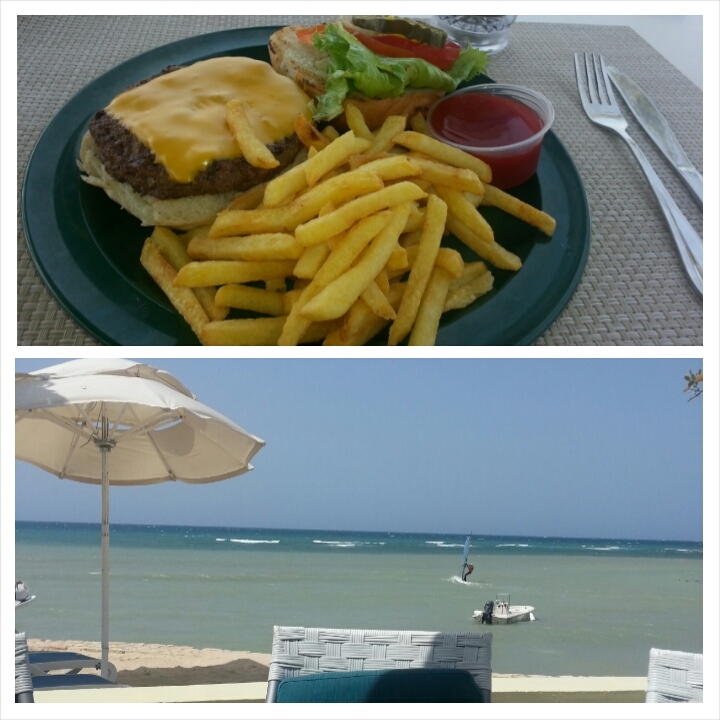 So overall the Seaside Grill is a good choice for dinner at the Hilton Rose Hall Resort and Spa, Montego Bay. Who is going home, gone home and who will top the groups for World Cup 2014?! Camaroon should be going home. Brazil may top the group as they meet Camaroon next. Mexico and Croatia to vie for 2 nd place. Spain has gone home. So has Australia. Netherlands and Chile will face each other with 2nd place likely to face Brazil. Note that Van Persie will be sitting the next game out for the Netherlands due to 2 yellow cards. Greece and Japan should be going home with Columbia topping the group and Ivory Coast in second place. Though we still should keep an eye on Japan. England should be going home with Uruguay likely to follow. Uruguay still has a little hope but its all in Italy’s hands who should top the group with Costa Rica in 2nd. So Columbia will face either Costa Rica or Uruguay. Matches to play out by Sunday, however top of the groups should be France, Argentina, Germany and Belgium respectively.